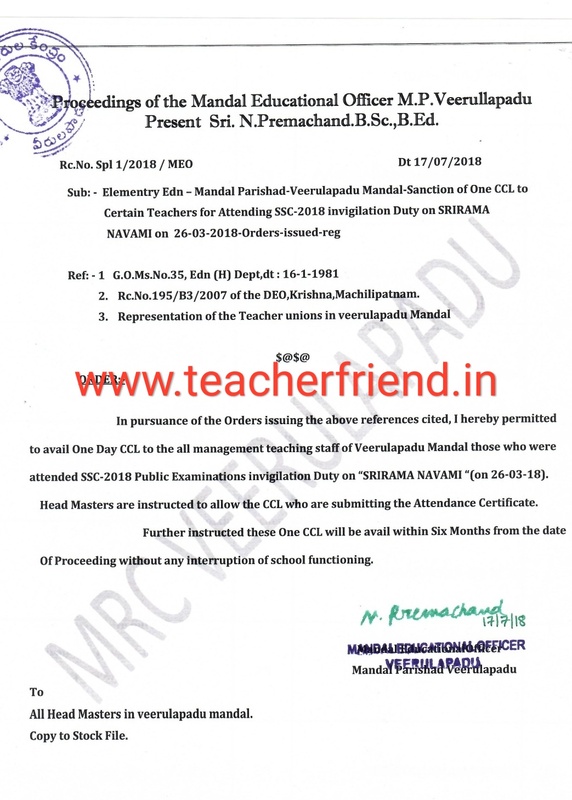 Sanction of One CCL to Certain Teachers for Attending SSC-2018 invigilation Duty on SRIRAMA NAVAMI on 26-03-2018 as per Rc.No:SPL/2018. 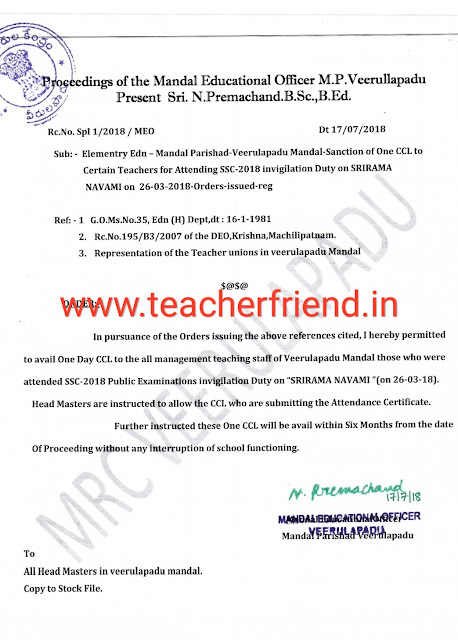 AP Elementry Edn Mandal Parishad-Veerulapadu Mandal-Sanction of One CCL to Certain Teachers for Attending SSC-2018 invigilation Duty on SRIRAMA NAVAMI on 26-03-2018-Orders-issued as per Rc.No. Spl 1/2018 / ME0 Dt 17/07/2018. AP Sanction of One CCL to Certain Teachers for Attending SSC-2018 invigilation Duty on SRIRAMA NAVAMI on 26-03-2018. G.O.Ms.No.35, Edn (H) Dept,dt : 16-1-1981 2. Rc.No.195/B3/2007 of the DEO,Krishna, Machilipatnam. Representationof the Teacher unions in veerulapadu Mandal. In pursuance of the Orders issuing the above references cited, I hereby permitted to avail One Day CCL to the all management teaching staff of Veerulapadu Mandal those who were attended SSC-2018 Public Examinations invigilation Duty on "SRIRAMA NAVAMI "(on 26-03-18). Head Masters are instructed to allow the CCL who are submitting the Attendance Certificate. Further instructed these One CCL will be avail within Six Months from the date Of Proceeding without any interruption of school functioning.